Enjoy one month's worth of discounts to Switzerland's public transport systems - up to 50% off! Read our Swiss Rail Pass Guide and find out the best things to do in Switzerland! fast delivery with many freebies! this half pass saved my money alot alot. will buy again if visiting swiss! Travel all over Switzerland while enjoying awesome discounts with the Swiss Half Fare Card, which lets you purchase tickets to trains, buses, boats, premium panorama trains, and even some cable cars. Enjoy up to 50% off on tickets for Switzerland's public transportation systems for one calendar month - simply purchase your train/bus/boat tickets with the Swiss Half Fare Card to get your discount. After that, just hop on board, find a seat, and relax as you're taken to the different destinations in the country. Not only that, this discount card also include discounts when using urban public transport across 90 cities in Switzerland. It's the best option when you want to save money on transportation services in the country! When purchasing tickets at local stations, please present your passport or proof of residence and Swiss Half Fare Card to get a 50% discount. Never leave them at home! The Swiss Half Fare Pass is much worthwhile than the Swiss Pass. If to use it along with Saver Ticket, you can save awesome a lot of transportation fee. For example, you enjoy 50% off for Jungfrau railways with Half Fare Card but only 75% by using Swiss Pass. The Swiss Half Fare Pass is much worthwhile than the Swiss Pass. If to use it along with Saver Ticket, you can save awesome a lot of transportation fee. For example, you enjoy 50% off for Jungfrau railways with Half Fare Card but only 75% by using Swiss Pass. Very good for those who will travel around Switzerland for period of one month. You have the flexibility to use this half fare card together with your individual ticket at half fare. Tickets for train up to mountain like junfraujoch, gornegrat are also half fare with the half fare card. Very good for those who will travel around Switzerland for period of one month. You have the flexibility to use this half fare card together with your individual ticket at half fare. Tickets for train up to mountain like junfraujoch, gornegrat are also half fare with the half fare card. Swiss half fare card is the best way to explore Switzerland by train or by any means of transportation. it provides 50% discounts on all the Travel option, activities, excursions and anything and everything. just carry it everywhere with you. losing it means losing lots of money. Swiss half fare card is the best way to explore Switzerland by train or by any means of transportation. it provides 50% discounts on all the Travel option, activities, excursions and anything and everything. just carry it everywhere with you. losing it means losing lots of money. Swiss rail pass is good option to explore Switzerland if you are planning to travel daily or already 4 to 5 times. it also gives discount of Jungfrau mountain peak so that is the main benefit.should go for it. recommended. Swiss rail pass is good option to explore Switzerland if you are planning to travel daily or already 4 to 5 times. it also gives discount of Jungfrau mountain peak so that is the main benefit.should go for it. recommended. 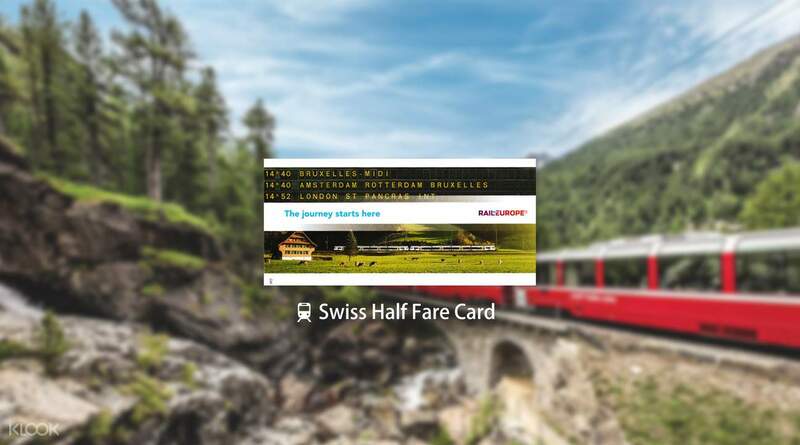 Swiss half fare card is one of the best and easy and cheap way to travel within Switzerland as it provides 50% discount on all the trains and most of the excursions and activities. booking online via klook is easy and quick and fast delivery of the same. do carry it everywhere as showing it is compulsory. Swiss half fare card is one of the best and easy and cheap way to travel within Switzerland as it provides 50% discount on all the trains and most of the excursions and activities. booking online via klook is easy and quick and fast delivery of the same. do carry it everywhere as showing it is compulsory. Received this together with travel adapter and a travel pack from Klook. Appreciate the nice gesture. Good price and hassle free. No need to go to train station to activate, just write in your passport number and sign and you can use it right away after the stated start date! Received this together with travel adapter and a travel pack from Klook. Appreciate the nice gesture. Good price and hassle free. No need to go to train station to activate, just write in your passport number and sign and you can use it right away after the stated start date! Buying Swiss Half Fare Card with Klook is the best decision we made. 7 passes in total for our 18 days trip in Switzerland. Price is much, much cheaper compared with the others. Booking was smooth and delivery of passes took less than a week all the way from Taiwan to Malaysia. Fully recommended to buy Swiss Passes from Klook. Thank you Klook for your great service! Buying Swiss Half Fare Card with Klook is the best decision we made. 7 passes in total for our 18 days trip in Switzerland. Price is much, much cheaper compared with the others. Booking was smooth and delivery of passes took less than a week all the way from Taiwan to Malaysia. Fully recommended to buy Swiss Passes from Klook. Thank you Klook for your great service!